Create a QnA chat bot from the Publish page for an existing knowledge base. This bot uses the Bot Framework SDK v4. You do not need to write any code to build the bot, all the code is provided for you. You need to have a published knowledge base for this tutorial. If you do not have one, follow the steps in Create and answer from KB tutorial to create a QnA Maker knowledge base with questions and answers. Create a bot as a client application for the knowledge base. In the QnA Maker portal, go to the Publish page, and publish your knowledge base. Select Create Bot. 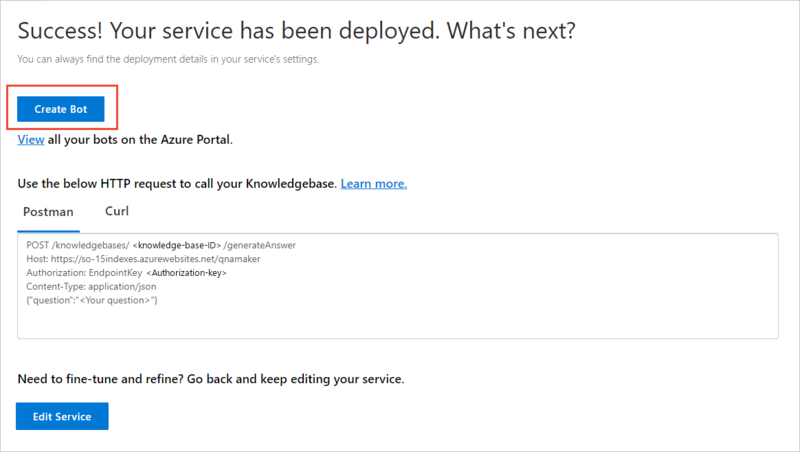 The Azure portal opens with the bot creation configuration. Bot name my-tutorial-kb-bot This is the Azure resource name for the bot. Subscription See purpose. Select the same subscription as you used to create the QnA Maker resources. Resource group my-tutorial-rg The resource group used for all the bot-related Azure resources. Location west us The bot's Azure resource location. Pricing tier F0 The free tier for the Azure bot service. App name my-tutorial-kb-bot-app This is a web app to support your bot only. This should not be the same app name as your QnA Maker service is already using. Sharing QnA Maker's web app with any other resource is not supported. SDK Language C# This is the underlying programming language used by the bot framework SDK. Your choices are C# or Node.js. QnA Auth Key Do not change This value is filled in for you. App service plan/Location Do not change For this tutorial, the location is not important. Azure Storage Do not change Conversation data is stored in Azure Storage tables. Application Insights Do not change Logging is sent to Application Insights. Microsoft App ID Do not change Active directory user and password is required. Wait a couple of minutes until the bot creation process notification reports success. In the Azure portal, open the new bot resource from the notification. 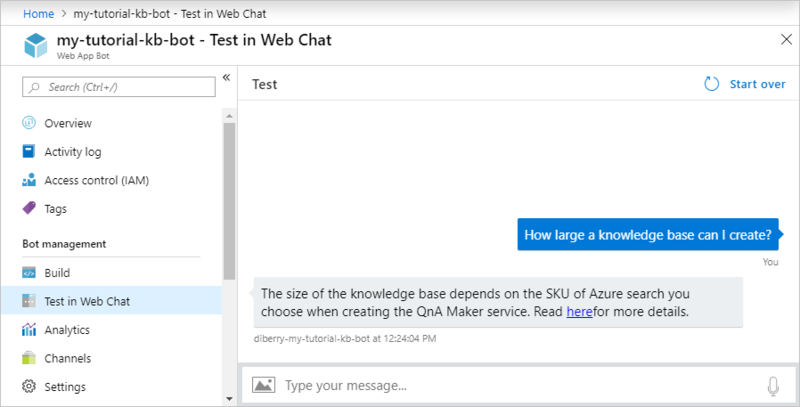 The size of the knowledge base depends on the SKU of Azure search you choose when creating the QnA Maker service. Read [here](https://docs.microsoft.com/azure/cognitive-services/qnamaker/tutorials/choosing-capacity-qnamaker-deployment)for more details. The QnA Maker help bot, used in the QnA Maker portal, is available as a bot sample. Healthcare bots use QnA Maker as one of their language models. 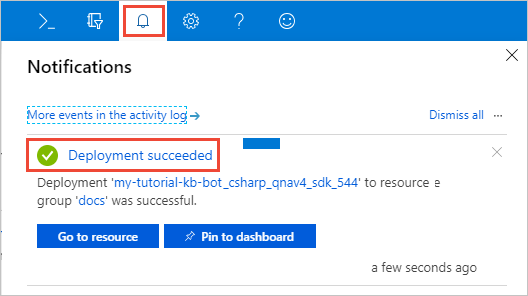 When you are done with this tutorial's bot, remove the bot in the Azure portal. If you created a new resource group for the bot's resources, delete the resource group.